Hi everyone, today I have an update on what is happening with me and the blog in the coming weeks. I just wanted to put some thoughts down on what has been happening and what is coming up for St Andrews Wargaming. First up, written battle reports have been a bit sparse recently. Don't worry, this is not a waning interest from me on the side of written reports. My games for the battle reports get played at the Spiky Club in Reading on a Friday night. This means that from time to time I don't get a game each week if I am away for the weekend or have plans on the Friday (a rarity, I assure you!). The last few weeks have been a bit sparse through illness and visits home, etc. I'm also going to be busy and away at tournaments for the next few weeks, so reports may be a little light for the coming weeks. Don't worry though, I'll be attending the Warfare tournament in Reading and another tournament up in Stockport in November. This means I'll have 10 tournament battle reports to write up come the end of November and December, so plenty of great content to come there. 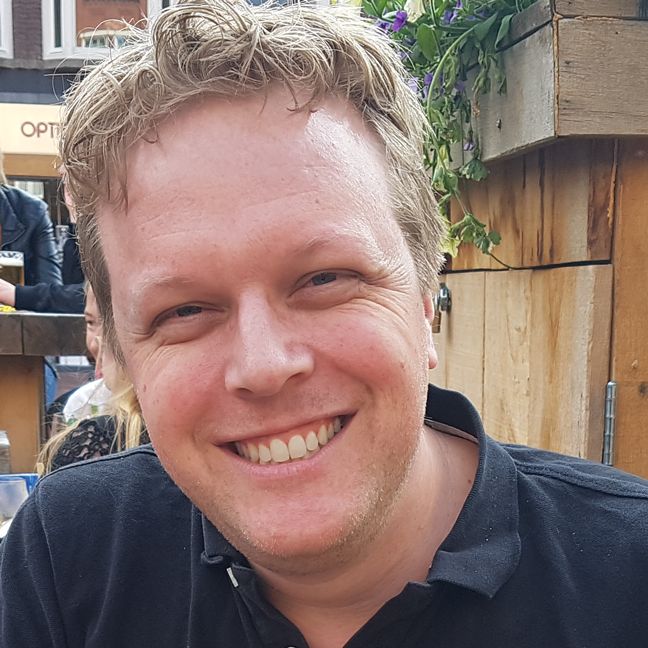 This week's Better Know a Blogger features Merijn from Another Wargaming Blog. 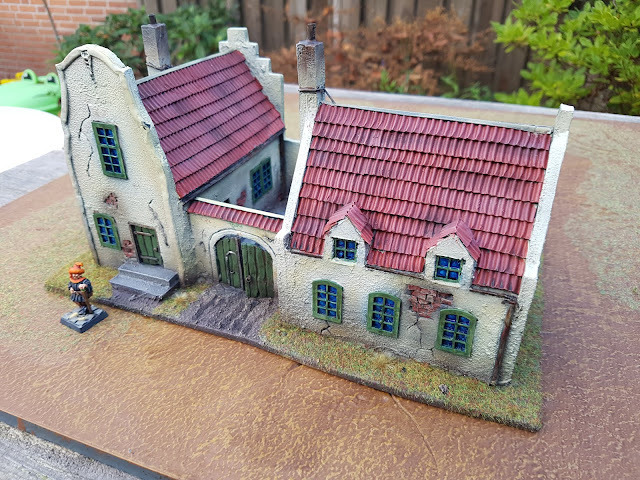 I first came across Merijn's blog a few months ago, drawn in by some of the awesome terrain work that he showcases on the blog. It was his Veerhuis construction and WIP shots that drew me in. 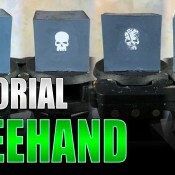 I love a good piece of scratch built terrain, and this looked to be an awesome project that was shaping up. Looking at the finished photos, I think you'll agree that he has done a fantastic job, creating a piece that would fit into any fantast-type or medieval game. Not only will you find fantastic terrain, you will also find some fantastic painted models, most recently focusing on Age of Sigmar Orcs. Merijn, in all his glory! 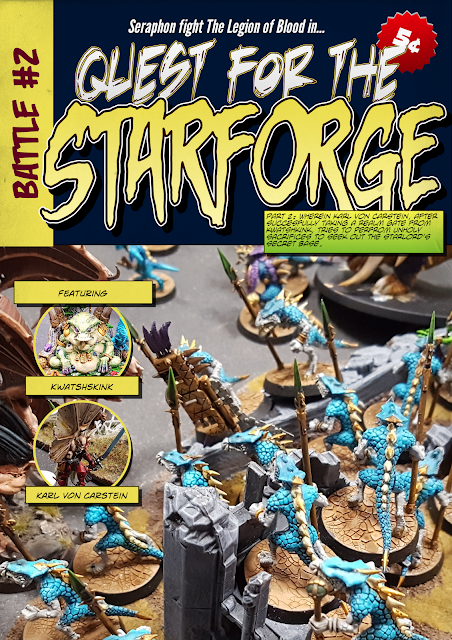 You will also find some really cool comic book style battle reports from his narrative campaign. 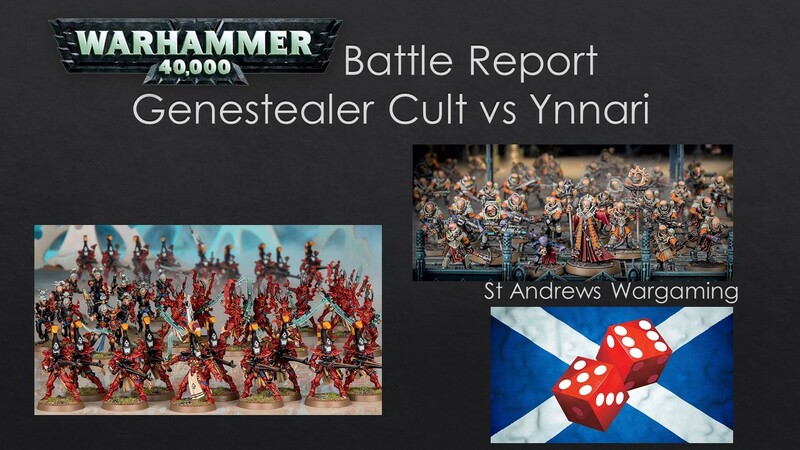 I love a good battle report, and it is nice to see a different style of reporting to my own. These are really easy to digest and a quick and fun read. I started way back in 1985 when I was 10 years old. My older brother convinced me to drop some pocket money in a shared buy of a new-fangled game called ‘Oog des Meesters’ (translated from Dutch: ‘Eye of the Master’). It was a roleplaying game which required us to gather more friends to actually play. We did. I never stopped roleplaying after that. The Warhammer Fantasy Battles 3rd edition launch two years later started my wargaming hobby. 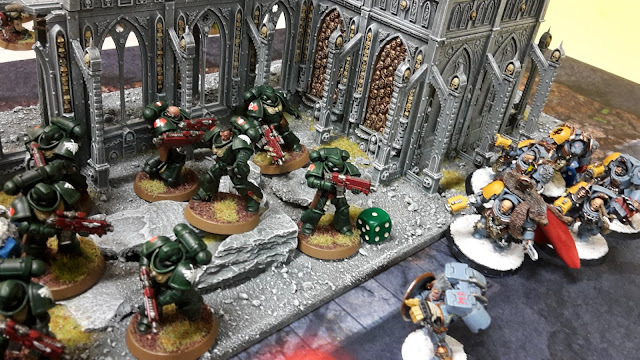 This week's Warhammer 40k battle report sees my combined force of Dark Angels and Deathwatch take on Chris' Space Wolves in a special maelstrom of war mission. This game was a practice for an upcoming tournament. In November, I will be attending Warfare in Reading. This features 5 games of custom missions, which I want to try out before the event. The mission we were playing was called All Out War. In this game, players draw three cards per turn, up to a maximum of 6 cards. At the end of each turn, you must discard your maelstrom cards until you have only 3 in your hand. The twist is that each maelstrom objective you discard, your opponent scores the points. For example, if you discard Defend Objective 3, your opponent scores 2 points for it. This makes trying to score cards each turn important, as anything you don't achieve could potentially help your opponent to win. I was intrigued to see how this mission played out, as it suits the way that I normally play maelstrom missions. 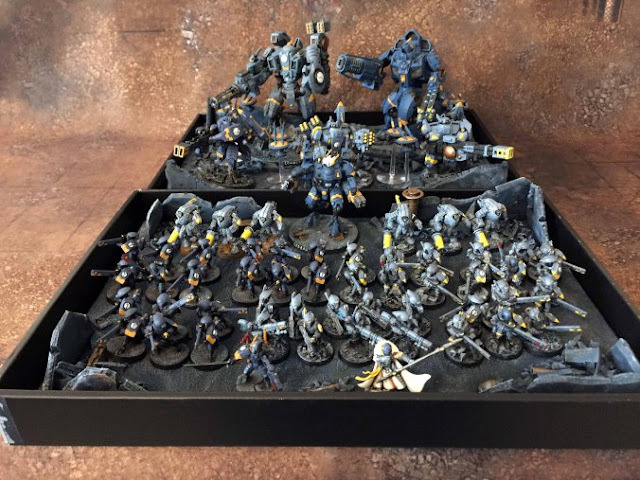 I had previously talked about my thoughts behind the army when I was building the list. This basically boils down to having the Dark Angels as a solid firebase, while the Deathwatch can act as a mobile reserves force for board control and targeting the enemy army. Another feature of the Warfare missions pack is a limit on 10 command points. This means that with my three Deathwatch units using the Teleportarium stratagem, I will only start the game on 7 command points. I'm normally used to a lot more to play with! (Note- the Auxiliary detachment doesn't count, as I can use "excess" command points to pay for this, I can only start the game with 10 CP). 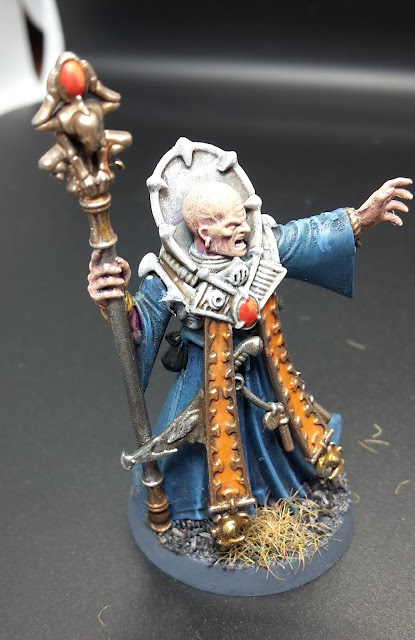 Another Warhammer 40k hobby update for you today, this time another Magus and Primus for my Genestealer Cult army. 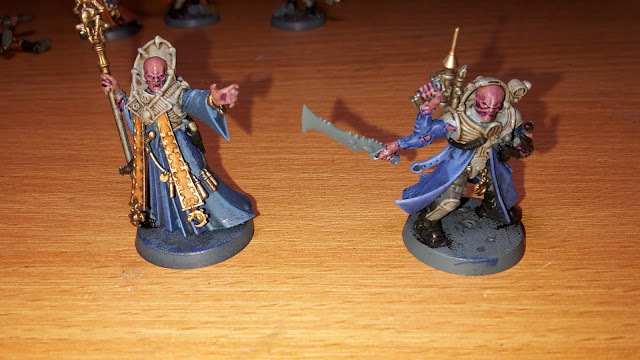 I painted these two up with blue robes and a coat, rather than the orange as is usual in the army. This is to allow me to distinguish them from the others in my army. 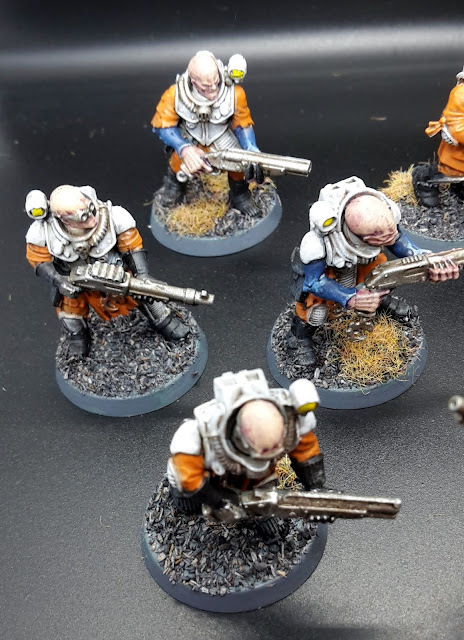 Today, I have another Warhammer 40k hobby update, this time featuring some more Neophyte Hybrids for my Genestealer Cult army. I decided to add a squad armed with Shotguns to give me some close range shooting punch. This could be a useful unit to ambush and get close to the enemy army to get the increased strength shots at close range. 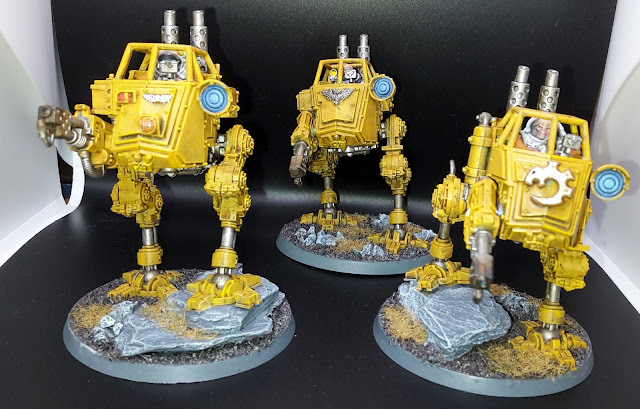 Today's Warhammer 40k hobby update features my three completed Scout Sentinels for my Genestealer Cult army. These Sentinels were converted to be crewed by some Neophyte Hybrids, so that their armour would match those of the rest of the army. I also magnetised the weapons, so that I could switch out their armament to suit the rest of my army. I had completed the bulk of the models previously, just needing to paint up the crew to finish off the models. I shamelessly copied the scheme from Dave at Confessions of a 40k Addict. 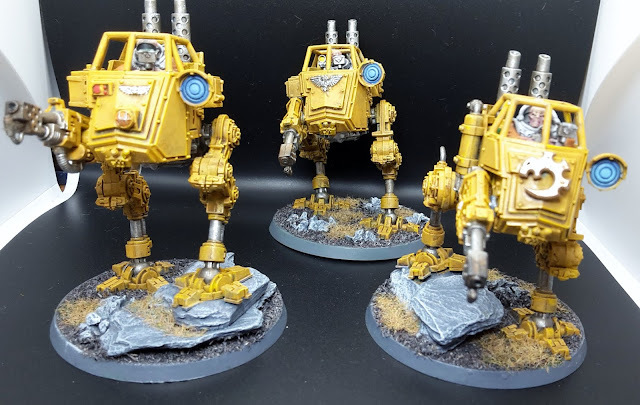 He painted up his Sentinels in a yellow scheme. I liked it so much, that I copied it for my own. It reminds me of the power lifters in Aliens, so I like the way the scheme goes with the army. Better Know a Blogger is back, and kicking it off this week is Iapedus Maximus from Languor Management. Languor Management has a strong focus on Iapedus' T'au army, with frequent painting posts, and tournament reviews to sink your teeth into. 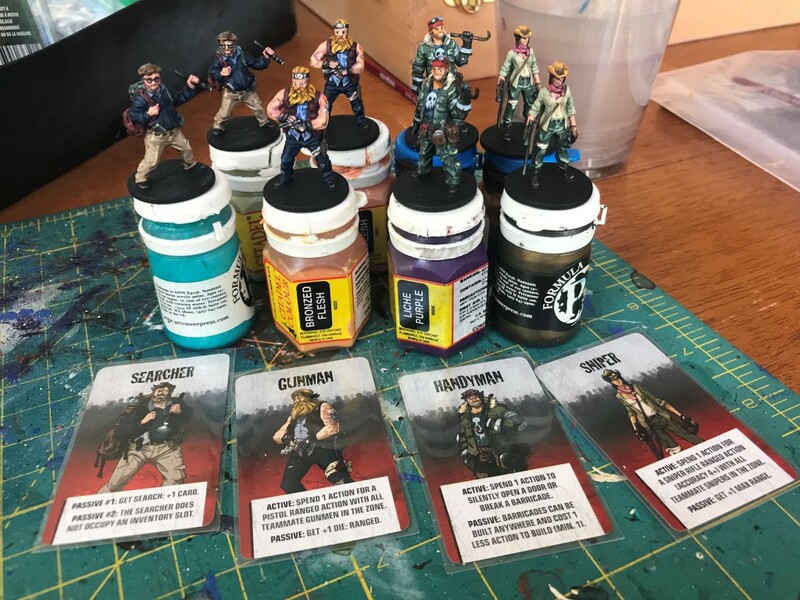 You can also find a whole host of ebay rescue stories and unboxings of the latest goodies from GW. A recent post that caught my eye was his aim to go a whole year without buying any new miniatures. Madness, I hear you cry, but I wish Iapedus every joy with his foolish endeavour! Be sure to check out and follow his blog, it is one of my regular reads and a great blog that I keep coming back to. I really enjoy the tournament reports, its a great insight into playing a different army competitively and seeing the experience of other people at events. I must have been about 10, and was visiting some friends of my mothers who's kids just happened to have got a copy of Heroquest for their birthday. Up until that point I didn’t really enjoy going around their house to visit, but from the moment I saw all those little figures and doors being setup and was handed my little scrap of paper to note down what happened to my character, I was hooked. From then on I always looked forward to going round, sometimes even convincing my mother to let me stay on and walk the mile home through the fields and lanes just so I could finish the quest we were on. It was great. Most recently, I have been using the Dark Angels and Deathwatch as separate army forces. The Dark Angels army performed well, but did suffer a few drawbacks in the force. The army had no reserves, meaning they were susceptible to the enemy firepower, as everything was on the board. The mobility in the army was provided by the Black Knights and Ravenwing Bikers, who suffered a bit in the army. They have some good firepower, but really lack the durability to stand up to the enemy firepower. 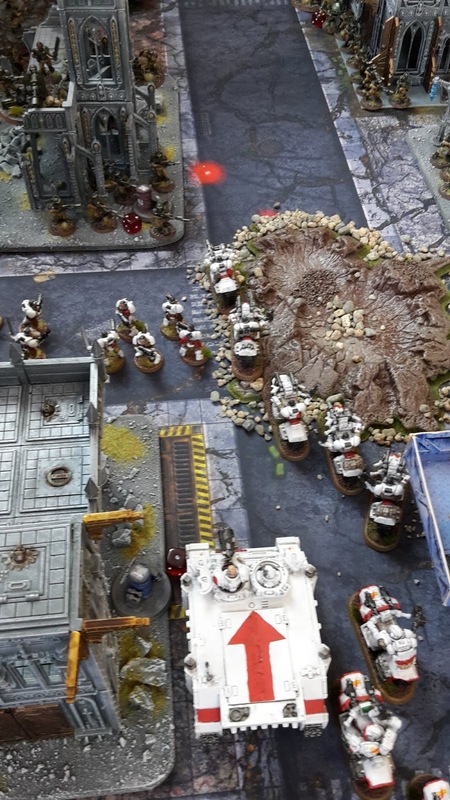 The Deathwatch hit hard, with the special issue ammunition and stratagems doing well to give them some strong firepower and some limited mobility. I thought that it might be worthwhile to combine the two armies to get the best of both worlds. 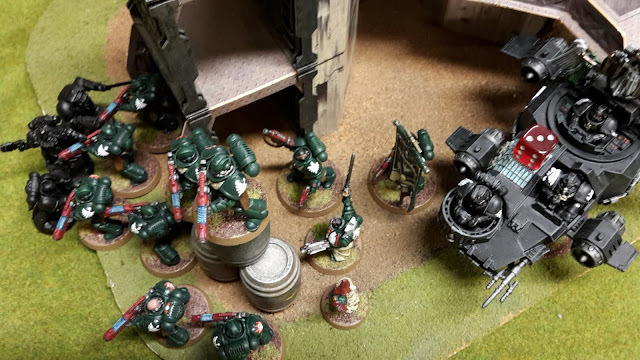 The Dark Angels to supply a solid firebase and some strong Plasma firepower, while the Deathwatch would give me some reserves to threaten enemy units, as well as giving me a degree of mobility with their deployment options. So here is my first proposed army. 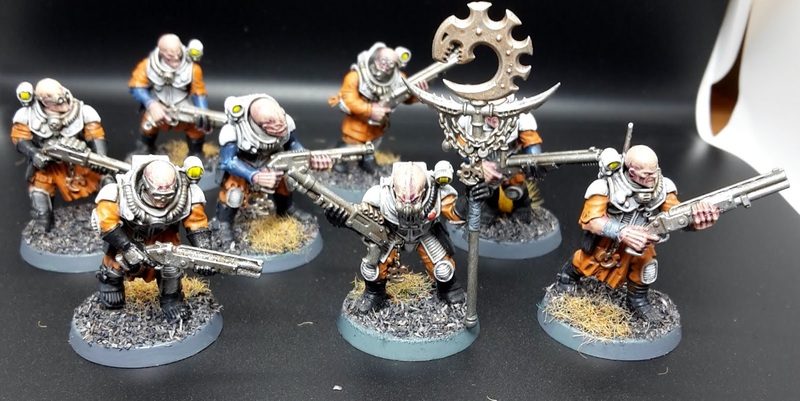 Today's warhammer 40k hobby update features some more units for my expanding Genestealer Cults army. 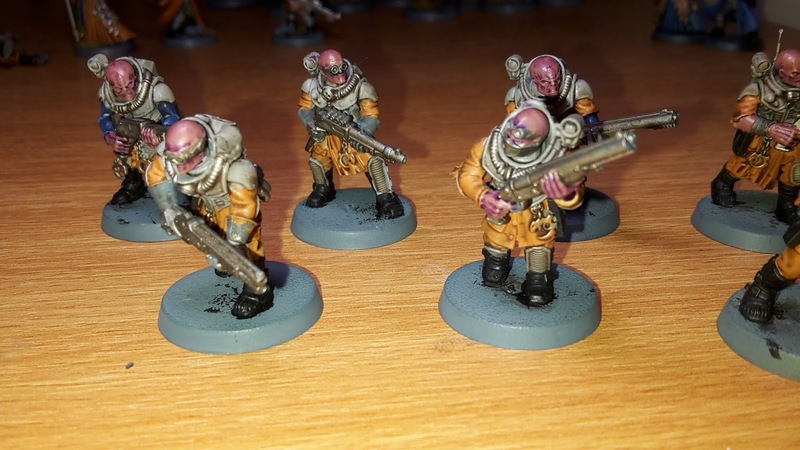 I am currently working on adding another Neophyte Hybrids squad armed with Shotguns, a Magus and a Primus. 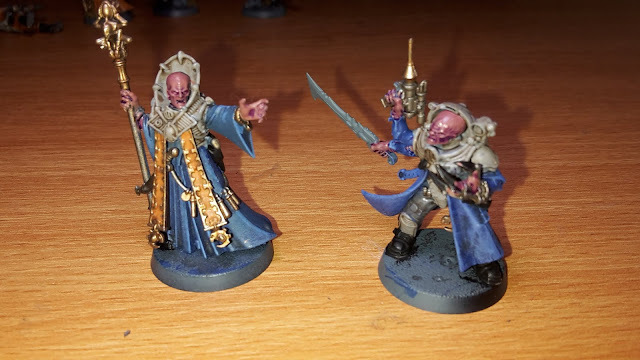 I decided to paint the Magus and Primus in blue robes. 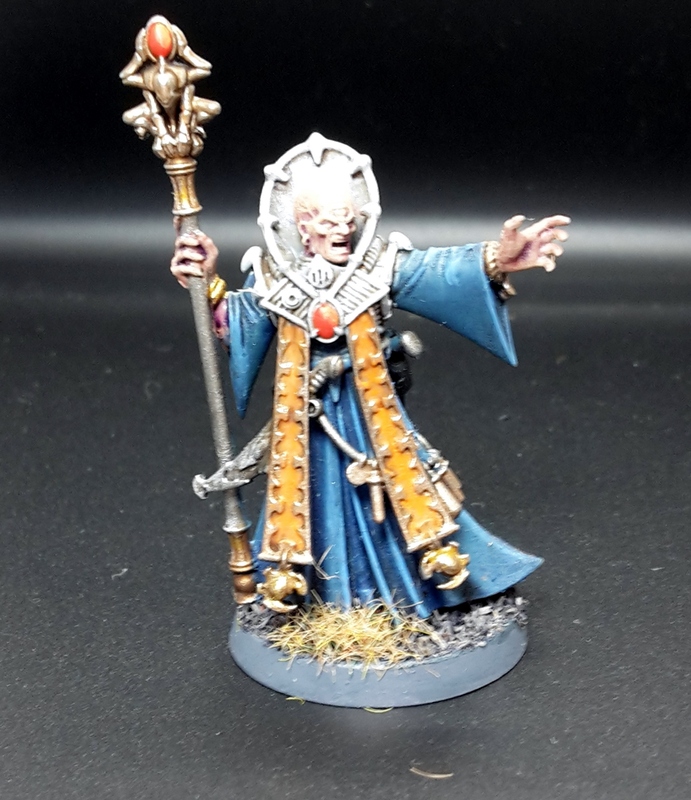 My other models have orange robes, so this will help distinguish them on the tabletop. These are at the wash stage, ready for the final highlights to finish them off. Remember, for more hobby updates and blog info, join the St Andrews Wargaming Facebook page. 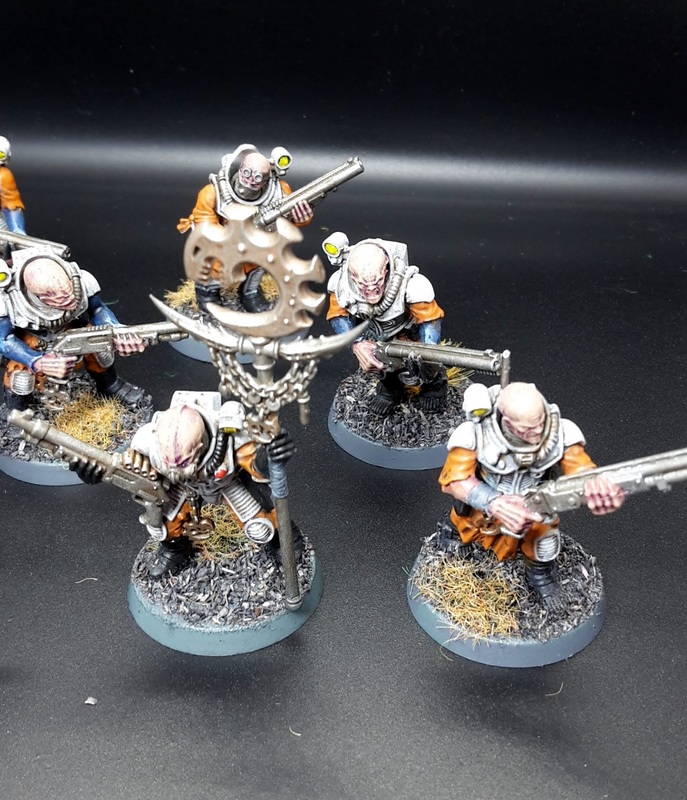 Today's Warhammer 40k hobby update features some more units for my Genestealer Cult army. 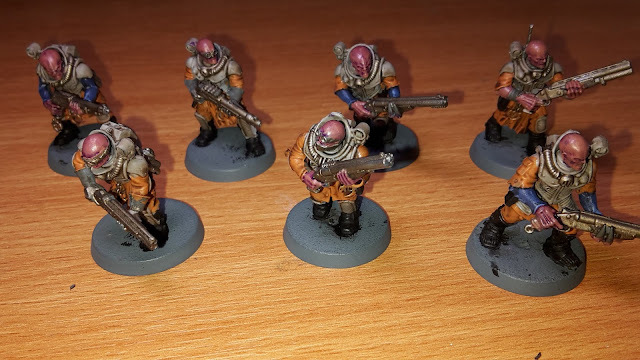 This weekend, I was able to get more hobby work done on my Genestealer Cults army. 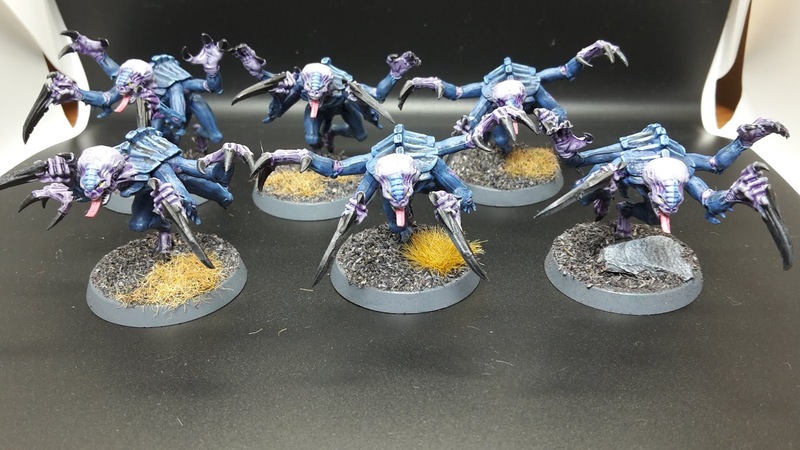 I painted up another 16 Purestrain Genestealers to add to the 16 already in the army. These were put on 32 mm bases, as opposed to the 25 mm ones they were supplied with. I think they just look better on the bigger bases. I've just had an article go up on the Warhammer Community page! 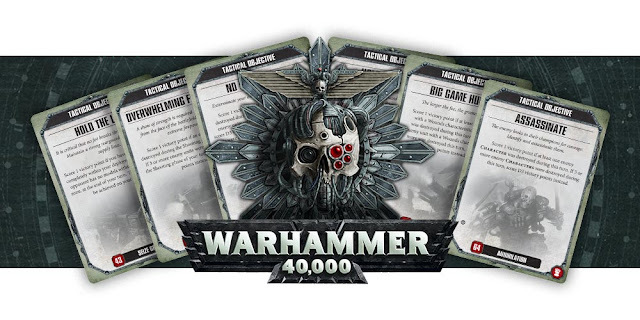 I was contacted a few months ago to see if I would be interested to write an article for the Warhammer Community page. After thinking about it for a nanosecond, of course I accepted. I wrote up the article you an now read on the page about one of my favourite ways to play the game, maelstrom of war. I honestly never thought it was going to be posted, it had been so long. But with a long release schedule, it finally went up today. To say I am happy about this is an extreme understatement! 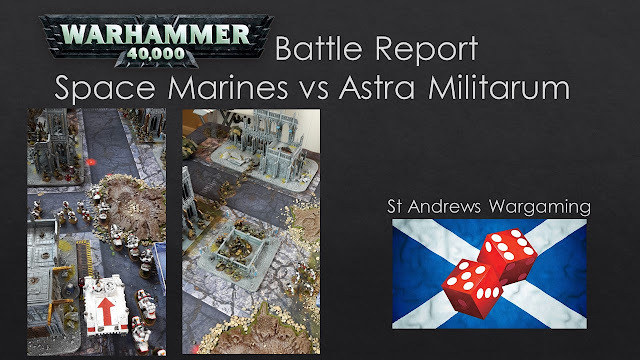 This week's battle report sees two ancient adversaries take to the battlefield, as my Dark Angels take on Ben's Space Wolves in a 2000 pts maelstrom of war game. This game was played just after the new FAQ dropped, so we didn't use the new rules as we hadn't had a chance to go through them in detail. We played the Race to Victory maelstrom mission. This is where the game ends when the first player reaches 10 cards scored. A bit of a different force for me to try out with my Dark Angels. I decided not to take Azrael and the Hellblasters (my favourite 80s prog rock band), they are pretty much an auto-include, but I wanted to try out something different. I thought I would go with a heavy Ravenwing contingent, backed up by some Scouts and Primaris Marines. I made the Primaris Master my warlord, he would go to the back and buff the nearby squads, while trying to keep safe from the enemy army. I took a big unit of Intercessors. The -1 AP on their weapons should help against other power armour. 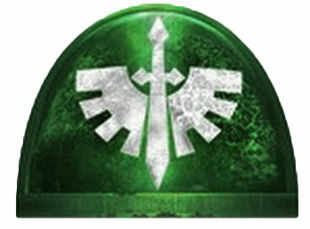 Big squads don't worry the Dark Angels, as they can't lose more than one to a failed morale test. I also added a couple of units of Scouts and a unit of Devastators for the Hellfire Shells stratagem. 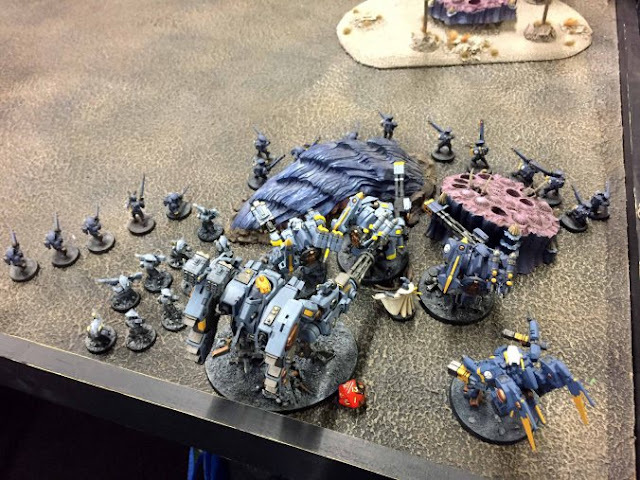 For the Ravenwing contingent, the force was led by Sammael and a Talonmaster. 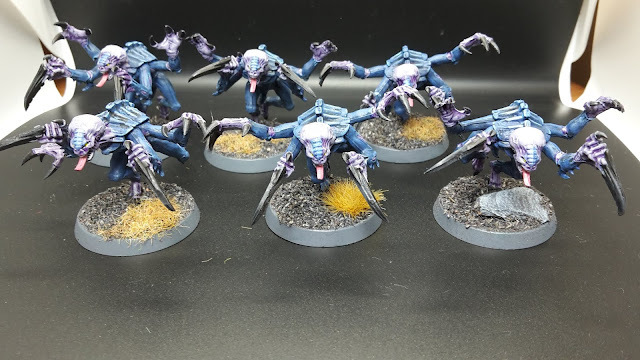 Sammael is great for buffing the nearby Ravenwing units, as well as being pretty good in combat, which should be handy against the Space Wolves. 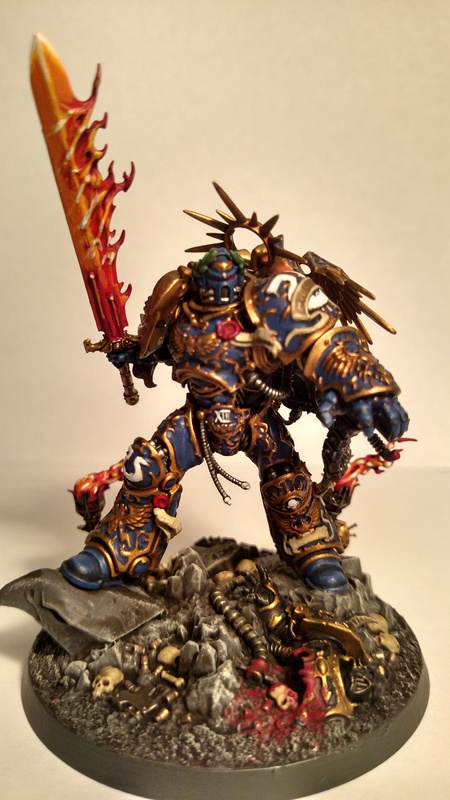 I haven't really used the Talonmaster much, so wanted to see how he would perform in the list. His Twin Heavy Bolter and Twin Assault Cannon should be of use, I also gave him the Heavenfall Blade to help him out in combat too. I decided to take a big unit of Black Knights, backed up by a Ravenwing Apothecary and Ravenwing Ancient. 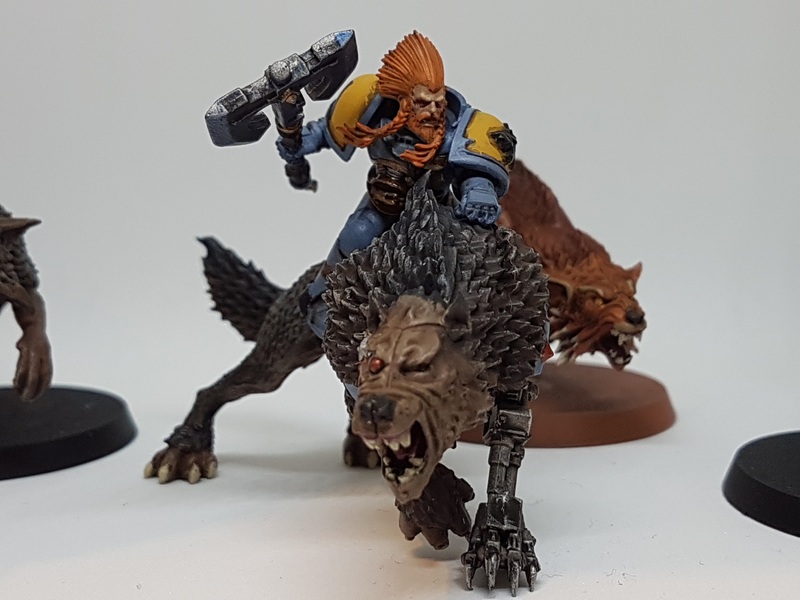 I was hoping the Plasma could take care of any Space Wolves, while using the Apothecary and Ancient to buff the unit in combat and keep them alive for longer. I wanted to try out some Landspeeders too. I had heard some good things about them, so wanted to see if their mobility and firepower was worth taking in my army. 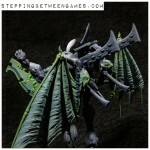 Today I have another Army Showcase for you, with Ricki's Blades of Caliban Dark Angels force. I spotted this army on one of the 40k facebook groups and was blown away by how impressive it is. I quickly contacted Ricki to see if I could feature it and ask some questions about how the army came together. 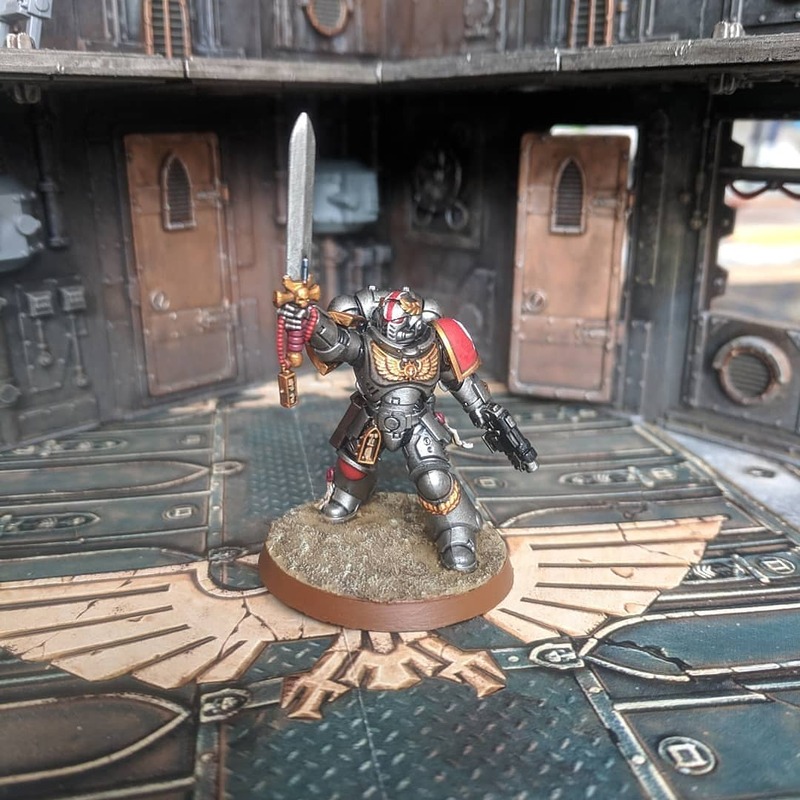 This initial force is part of an escalation league he is taking part in, and I cannot wait to see how the army progresses in the coming months. 1. Why did you start the army? For the past few years I have been primarily an Age of Sigmar player, having stopped playing Warhammer 40,000 midway through 7th edition as I sought the more narrative and open structure of Age of Sigmar to indulge my own personal obsession with conversion-based, narrative armies rather than the more competitive matched play scene perpetuated by Warhammer 40,000 in my area (entirely anecdotal of course). With my brother getting back into the Warhammer universe and picking up 40,000, and a friend nearby looking to start gaming for the very first time who also preferred the lore behind 40k, it seemed like a natural start point for me to rejoin the far future and put my Age of Sigmar projects temporarily on hold.